In this tutorial, we will show you how to configure Sendmail to use a virtual user table that’ll allow us to set up user-specific, domain-wide email aliases with multiple domains on our server. This guide should work on other Linux VPS systems as well but was tested and written for Ubuntu 16.04. In our case, the domains we want to set up email aliases for are test1.com and test2.com. Make sure you have your domain’s MX records pointing to your VPS hostname before you configure Sendmail to use them. Make sure these lines are added before the MAILER() line, otherwise Sendmail will return a warning/error on compilation. The command sendmailmenuconfig will ask you a few questions whether you want to use the new configuration and reload it, answer y(or yes) on all. Again, answer yes to all the questions the sendmailconfig command asks you. Note: Remember to replace the user and domain examples given in this tutorial with the names of your actual users and domains. Of course, you don’t have to do any of this if you use one of our Service Configuration & Optimization Services, in which case you can simply ask our expert Linux admins to set up a mail server for you. They are available 24×7 and will take care of your request immediately. PS. 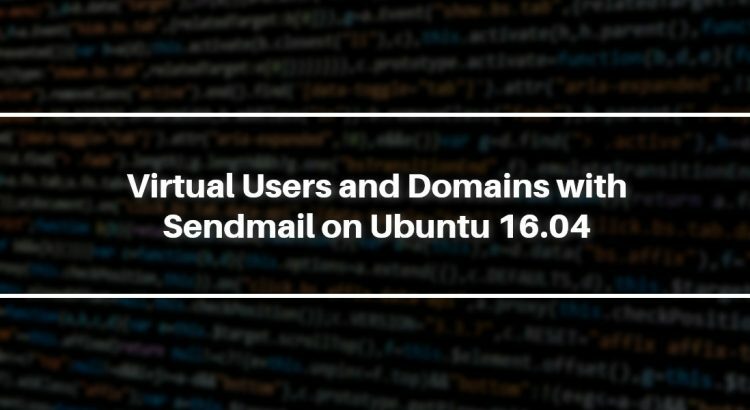 If you liked this post, about Virtual Users and Domains with Sendmail on Ubuntu 16.04, please share it with your friends on the social networks using the buttons on the left or simply leave a comment in the Comments Section below. Thanks.